This is an aide memoire for myself, but if you have found really useful Screaming Frog tips to get the most out of the tool, please leave a comment or email me at hello@jacknorell.com. If I include the tip, you’ll get a link back to your blog or Twitter handle. By using “Contains” in the Custom settings, the filter will find if the page is currently linking to your site, though in this version not whether it is nofollowed. If you have a modified RegEx to check for nofollow links, please do share in comments. That default expression won’t work. However, if you use (?s). * instead, it will work just fine. This is a bit messy, but if a page is linking to example.com, it will extract the text from ‘example.com’ to the next closing anchor tag </a>. This may at times capture other HTML tags that wrap the anchor text itself inside the <a> tag, if those tags have spaces before or after as the regex currently does not handle spaces well. You can find these easily by running a =find(“<“, [cell reference]) to locate any tag opening sharp brackets, then clean up manually. Note that only the first link’s anchor text will be extracted. If the page has more than one link to example.com, you will need to use a script to break up the page source code and iterate through the resulting text strings. If you have a more sophisticated working example, please share in the comments. More Screaming Frog tips & tricks will be added over time. Google Translate works very well together with Spreadsheets to turn whatever language you don’t read into your own (or English of course). Once you’re acquainted with the functions used, you’ll quickly be able to modify your original text into whichever language you require. With a bit of clever work, you could automate processes, by connecting your sheet with If This Then That (IFTTT). Below I’m providing two examples of applications I’ve found useful. But first, we’ll review the formulas. 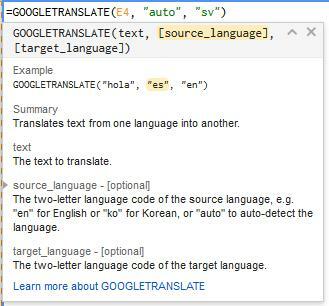 Google spreadsheets has two formulas to help you both translate and identify the language of text within a column. =GOOGLETRANSLATE(text, “auto”,”en”) to translate these anchor texts into English. You don’t need to set the target language, as it will default to the language used in the spreadsheet. Full list of 2 letter ISO language codes on Wikipedia. In my consulting work, my team and I often come across backlinks in a range of languages and alphabets. Of course, this makes it difficult to evaluate backlink profiles: Is that anchor text a Brand, Compound, Money or Other term in our classification? Rather than just shrug our shoulders and chuck all of these incomprehensible text snippets in either Money or Other, I decided that using Google Spreadsheets to translate the lot would be more helpful. By using the formula =GOOGLETRANSLATE(D8, “auto”, “en”) in the appropriate columns, we’ll end up with a translated text. In our work, we would now be easily able to classify the anchor texts in the right groupings. 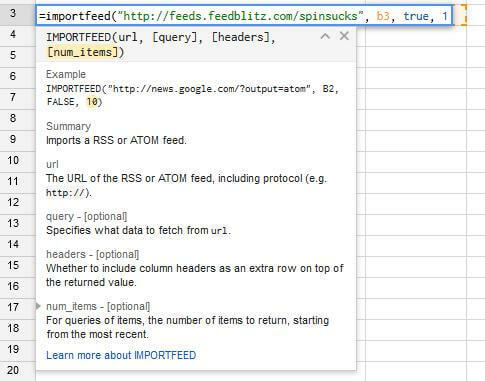 While Google Reader is no more, Spreadsheets can use the ImportFeed formula to import RSS or Atom feeds. URL is the url of the RSS or ATOM feed. feedQuery/itemQuery is one of the following query strings: “feed”, “feed title”, “feed author”, “feed description”, “feed url”, “items”, “items author”, “items title”, “items summary”, “items url”, or “items created”. The feed queries return feed properties; the feed’s title, the feed’s author, etc. If you want the feed data, do an “items” request. The above is of course a very basic implementation of the formulas, but gives you a starting point to develop from. IMPORTXML: Imports data from any of various structured data types including XML, HTML, CSV, TSV, and RSS and ATOM XML feeds. IMPORTDATA: Imports data at a given url in .csv (comma-separated value) or .tsv (tab-separated value) format.